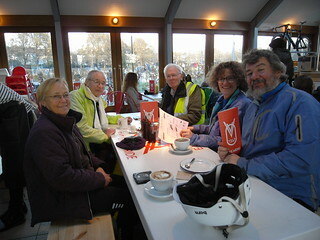 Nine riders met at The Level: Fiona, Fred, Jenny, John, Julian, Roger, Sikka Sue, Simon, and Suzanne. After negotiating the Vogue Gyratory we used the new improved cycle path along the A27 to get to our first detour, a quick buzz around always-beautiful Stanmer Park. Then through the underpass to the other side of the main road, and up the many twists and turns of the Meccano-like ramp over the railway at Falmer station. It’s amazing how much engineering and metalwork is required to provide access for wheel-users in a confined space – relative to building stairs that is. 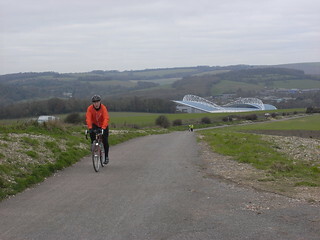 The next detour was a pootle round the perimeter of the Amex ‘Community’ Stadium. What a soul-less, horrible building it is, with its acres of tarmac and wire-netting fences, and so out of place (other opinions are also available). Out and across the traffic lights we found the as-yet unmarked entrance to the lovely new shared-use path that runs alongside the B2123 from Falmer to Woodingdean. At last walkers, cyclists, and horse-riders are spared having to risk their lives in the fast-moving traffic, as what was once a lumpy permissive bridleway along the field edge has been upgraded, widened, and surfaced with fine crushed and rolled limestone that is suitable for all bikes, not just knobbly-tyred ones. Sadly, in some places the surface has already been a bit eroded by rain water but it was chosen to be less intrusive in the landscape than tarmac. The path is separated from the road by a generous embankment, and there’s a grass strip alongside that hopefully will be preferred by horse-riders. The route provided an unaccustomed experience for the Clarions as the hill rose up and up, but the views from the top are spectacular. Julian reported that he saw a very low-flying buzzard, and Fred saw a kestrel. We passed Bullock Hill, the best-kept secret mentioned earlier. The descent into Woodingdean was long and exhilarating – my computer reported a maximum speed of 37.6 mph, in what could well have been a 30 mph zone, oops. 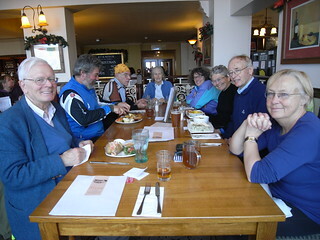 Lunch at The White Horse in Rottingdean was a slightly disorganised affair, with the food taking its time arriving, but it was worth the wait. Then we said goodbye to John and headed back into town along the pancake-flat and more Clarion-friendly undercliff. 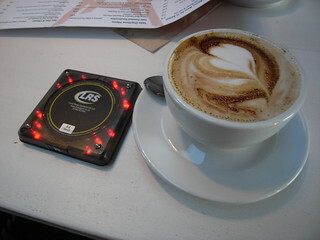 Six of us detoured back to The Level again to try the new Velo Café – good coffee, excellent cake, a reasonably priced menu of bike repairs on offer, and a flashing, vibrating gadget to alert customers to collect their order. We liked it. My route home along the seafront was enhanced by a millpond sea and a truly spectacular sunset. Thanks Roger for organising this ride and introducing the new circuit – the link between Falmer, the South Downs Way, and the coast has been a long time coming and we enjoyed trying it out. 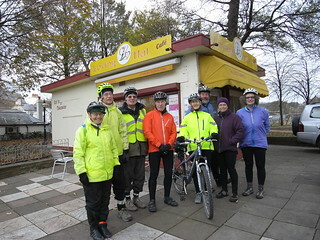 We’ve pimped our ride east on the NCN2 to Berwick, which had to be cancelled earlier in the “summer” as headwinds of 20+mph & torrential rain rendered it impassable, unpleasant & virtually impossible, although we did turn up in case there were determined masochists among our readers. We’ve found another modification which renders the stony, pot-holey, steep & almost unbikeable section from Peacehaven to Newhaven, delightful. Come and see. We’ve booked The Ark at Newhaven again for around 12.15 as we have a tea garden tea stop for later. The Ark has a very good fishy menu, being next door to the fish market with harbour views. Back on the track after lunch we revisit the Nature Reserve at Tidemills – traffic-free to Seaford sea-front. No hopes for a swim there this time, but chance to sample our lovely deviation at Seaford Head. A very short section on busy road then a left turn back to peace & outskirts of Friston Forest. Litlington Tea Gardens says it’s open in good weather up to Xmas so let’s hope we have some. If not, hot tea needed can be amply provided at Alfriston. 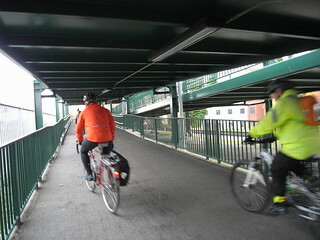 From there the NCN2 is very signed, off-road in places & swift for access to the train station. Trains at 15.48 & 16.48, Londoners can change at Lewes. Meet at 10.30 at Palace Pier. Hope to use Undercliff but will check out high tide & pebbly conditions, which, though dramatic, could damage tyres, not to mention give riders a good soaking. Distance = 24miles. If too much can return via Seaford station. Hills – undulations, but impressive views! Trains – 15.48 & 16.48 from Berwick. Stations at Newhaven & Seaford for early returners. or drop-outs. Let’s hope the prevailing west wind prevails on Nov 18th & wings us on our way.